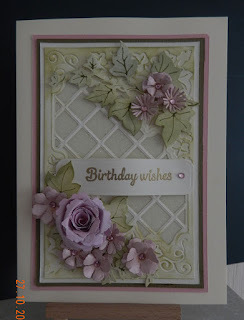 This Friday's Challenge is hosted by the lovely talented Jo and she has chosen Flowers as her theme. 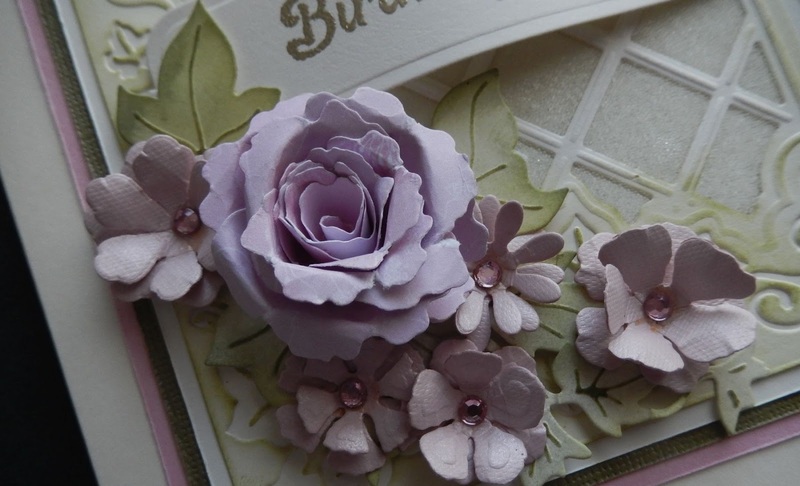 I have always loved making my own paper flowers and some of the dies available today enable you to make very realistic flowers. For the background I have used Sue Wilson's Greek Island Background die, it's very unusual in that it has a deep debossed area of ivy leaves with a central diecut section of trelliswork. 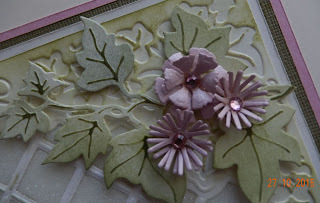 I matted and layered this up on green and Pink mats and then arranged my flowers and some beautiful diecut ivy, added a sentiment and I was done. I hope you will join in with us, entering is so easy all the details are here The DT team all look forward to seeing your entries and leaving comments on your blog if you have one, otherwise you can enter via email. Beautifully elegant Annie!! So very classy...your handmade flowers are gorgeous and those leaves so very realistic looking!!! Have a fabulous weekend Annie! This is a beautiful card and I love the subtle colours . Wow, what a gorgeous card, Annie. Beautifully designed. Love the colours scheme. Fabulous diecuts and I simply love your gorgeous handmade flowers.